Dr. Harold Urey was an American physical chemist and winner of the 1934 Nobel Prize in Chemistry for his work on deuterium and heavy water. 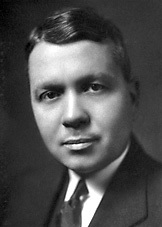 Urey worked on the Manhattan Project at Columbia University, overseeing the development of the gaseous diffusion method and the production of a suitable barrier for the separation of uranium isotopes. He discusses working with numerous colleagues, including Arthur Compton, Enrico Fermi, and General Leslie Groves. He also discusses his early life, his education, and his work following the war. Stephane Groueff: It is recording, Dr. Urey. Groueff: So where shall we start? Urey: Suppose I tell you about my background before the war? Well, my interest in isotope separation started with the discovery of heavy hydrogen, which I made at Columbia with the aid of Ferdinand Brickwedde in Washington and Charles Murphy, who was my research assistant. We started this by concentrating the heavy hydrogen in liquid hydrogen by distillation. We had calculated that there should be differences in the vapor pressures of HD and H2, there being little D2 in natural hydrogen because of the rarity of the heavy isotope. This was followed in the years following that by work on the difference in chemical properties of other isotopes, which is well known and which we developed during those years, myself, my students, post-doctoral fellows and others abroad and in this country, all through those years. So I was interested in separation of isotopes during that time. We succeeded in separating the hydrogen isotopes. We changed the relative balance of the carbon isotopes considerably by the methods we were using. When the war started and it became necessary to separate isotopes, I of course was interested in the heavy water isotopes and it was rather natural for them to work on this. Of course, I had never worked on the diffusion separation of the uranium isotopes. As a matter of fact, I was rather appalled with the job because of the immense difficulty of that job. I must confess that from the very beginning I was skeptical as to whether it could be done. The reasons being that we had an enormous corrosion problem of the uranium hexafluoride and the very small effect to be expected. The whole thing involved a scale of commercial apparatus, to which I was not accustomed in the slightest. Because of my interest in separating isotopes by chemical means, I was more or less dragged into it. Professor John Dunning at Columbia was interested in the uranium problem and had great faith that it could be done. When the organization in Washington was set up with [Lyman] Briggs, of the Bureau of Standards in charge of it, I was asked to represent Columbia University Groups all together. I tried to do this, and let Professor John Dunning run his own show. I reported what was going on and so forth. Groueff: Dean [George Braxton] Pegram was also on the committee? Urey: Dean Pegram was also on the committee, [Ernest] Lawrence and [Arthur] Compton, and [Enrico] Fermi. Fermi had a little difficulty because he was at the time not a U.S. citizen. We forgot all about it by and by. It made no difference in the end at all. The preliminary experiments were made during 1939, up until the time when it was taken over seriously by the Army and real sums of money and real laboratory expansion took place. The preliminary experiments were, to my mind, rather discouraging. We had no diffusion barrier that would work. The first diffusion barriers that we investigated would surely have never done the job at all. I forget details of this period. It is a long time ago and I kept no diary. It is a little difficult to remember just what the situation was. Groueff: It was not very encouraging. That is what everybody says. Urey: It certainly was not very encouraging during that time. The methods for separating the hydrogen isotopes were not nearly so difficult. There were chemical exchange reactions, isotopic exchange reactions that were known. For example, the equilibrium between hydrogen and water would favor concentration of deuterium in water. This could be used in concurrent schemes. In fact, this process was first investigated by Dr. [Adalbert] Farkas abroad. Other schemes of a similar kind were discussed. There was a possibility of the distillation of liquid hydrogen and things of this sort. The separation of the uranium isotopes was much more difficult. No suitable barriers were available. We had contacts with the British. I think my friend Francis Simon, whose picture is right there, was exceedingly skeptical as to whether we would succeed. One time they asked us to supply them with barriers, which we thought would work. I asked for a preparation of the barriers we were talking about. No one could produce a square centimeter of barrier. Urey: That was the Dunning Group. No one could produce a square centimeter of barrier. This disturbed me very much in regard to it. At about the time that General Groves took over, there was a complete reorganization of the whole program. As I remarked a moment ago, I asked to be relieved of the uranium separation part of the problem. I asked that John Dunning be put in charge of it. Groueff: You asked Colonel [Kenneth D.] Nichols? Urey: Colonel Nichols. I proposed this to Colonel Nichols in a conversation. If I remember the conversation correctly, he thought perhaps that if I would not take it over, that the whole project had to be discontinued. So very reluctantly, I agreed to take it over. The reason for my reluctance was that I was quite sure that Dr. Dunning was very jealous of his ideas in regard to separating uranium isotopes by diffusion. He did not want me in that position. I did not wish to take the position. Groueff: He thought it was his baby and he should take all the credit. Urey: Right. It was my impression that he regarded it as his baby and as a matter of fact, I also regarded it as his baby. Groueff: You did not work directly on this separation at that time? Urey: At that time, no. Groueff: You did not go to the laboratory every day like him? Urey: A lot of office work, trying to get men to help us and trying to recruit people to come in. Groueff: There was no laboratory? Urey: No, I did not work in the laboratory at all. As I say, if I remember the conversation correctly, they felt that they would close down the whole project unless I would agree to head it. I reluctantly did so. I never could quite understand why they wanted me in that position, because I could not see any signs that they had any particular confidence in my ability to run the job. Yet, I knew perfectly well that there were others that did not want me to do it also. That made it an exceedingly difficult decision. As a matter of fact, I thought that if the whole project had failed, it would be mine completely, but that if it would succeed it then it would be somebody else’s success. The latter has certainly proved to be true in the years since. Urey: That was it. I had the reputation and the Nobel Prize. All of these characteristics were to take responsibility for failure. Groueff: It is like patronizing the other leaders. They were all Nobel Prize winners, for instance electromagnetic with Lawrence, and Fermi, and Compton. Urey: That is right, yes, Fermi and Compton. They wanted me there for that reason. As we went along, we had very good luck. A man at Bell Labs—I should remember his name and I cannot remember it at the moment—discovered a method of making the barrier. It was not a good commercial method. But it had the right physical idea. Groueff: [Foster] Nix or [Edward] Adler? [Edward] Norris? Urey: No. Just a moment. He was at the operating company. Urey: Carbide and Carbon. He was an important man with the Carbide and Carbon. He was killed in an airplane accident. Urey: Felbeck. Felbeck had the idea of how to make this on a large-scale with the discovery of the mechanical method of producing the barrier and Felbeck’s contribution to making it on a large-scale, and I suppose there were others besides these men involved because many people worked on it—it became a possibility. It was late. Now the fact that the barrier would work, [that it] would not plug up and would be stable to uranium hexafluoride, was largely the work of Willard Libby, who is now at Los Angeles. He made the careful laboratory tests on the barrier that proved that it could be used. Groueff: The barrier proposed by Nix and Felbeck and the other guys? Urey: Yes. When the barrier was constructed, it still had to be shown that it would stand up under the conditions. This was due to Willard Libby. Groueff: He also worked on the first barriers, the unsuccessful ones? Groueff: He tried everything? The Columbia barrier did not work? Urey: I would say it was the work of Nix and Felbeck that brought these up. A great deal of work on these was then done at Columbia University. Willard Libby proved that they would work. This was critical for the whole thing. This was not gotten until way long in the program. Then the whole thing became feasible. Of course, there were many other parts of the program that were largely of a very engineering character. For example, getting the pumping devices that would pump the gas, the blowers, was a big engineering development. To which we made little contribution to that, as a matter of fact, at Columbia. Urey: Where was he, Swearingen? Groueff: He was the one who developed the seal. He was temporarily with Kellex. Urey: The seal? Yes. Where is he now? Groueff: He owns a big company in Los Angeles called Rotoflow. He seems to be very prosperous. Urey: I see. Well, that was an engineering job. Urey: A pure engineering job. Urey: Oh, yes. This was a big chemical engineering job. As a matter of fact, I think most of us working at Columbia, and I think it would be true of the people in Dunning’s group who were often very capable people, and the whole scientific group, that we were not particularly adapted to that engineering type of development. We had contacts with the engineers and that worked out. Groueff: Was there antagonism or jealousy between the two groups? Was it just a healthy rivalry? Groueff: Between the engineers and industry on one side and the scientific/academic people? Urey: I do not think there was much rivalry of any kind between the groups. I think everybody concerned with it tried awfully hard to make it succeed. I did not think there was any particular jealousy about the things of this sort. I think the attitude of the people working on it, both in industry and in the university, rose very well above such petty little difficulties as that. Groueff: Everybody tried different methods, and the one that succeeded was held by everybody else? Groueff: [Judson] Swearingen tells me that [Henry] Boorse was working on a pump. Groueff: Swearingen’s seal was the most successful, so Boorse helped with that very much. Urey: Oh, yes. I think that is true. They had an idea of a pump that they thought would not need seals. It did not work out. The other one did. Now let me see. Groueff: One thing they say in this New World book that you think is unfair is that in this period, when the new barrier was invented and the old one had to be thrown out, more or less, in the meantime they had this plant already working on Decatur [Ohio]. That was a very important decision, to abandon the old [plant]. Urey: Decatur? Where was that? I do not recall that. You have boggled me. Groueff: The way the story is written is that when a barrier was developed, but not a very good barrier, it was very late in the game and something had to be done. General Groves and Kellex people started a plant in Decatur with Houdaille-Hershey. Groueff: The new thing came and there had to be a switch. When they asked the British, the British said that they did not think it would be the right decision. They were very skeptical about the barrier. They said that you were also very skeptical. At that time, you thought that the time was running short and the whole gas diffusion had to be abandoned. That was the big conflict between you on one side, according to their sources, and General Groves or the Kellex people and the people who wanted to go ahead and risk the new thing. Urey: I do not remember this. It may be that it was that way. I can remember perfectly well that I was immensely discouraged because of the failure of these barriers and their inadequacy. The British also had the exact same opinion in regard to these. I think, as a matter of fact, the whole success depends on that discovery by Nix, of the method of making the barrier and its commercial development by Felbeck and his group. Otherwise, the thing never would have worked. Groueff: It never would have worked. Urey: It never would have worked. Now, there have been many modifications of that barrier, I understand, that made sense. I am not well acquainted at all. Groueff: From what I understand, the Kellex group gave the final—the existing pumps as they are functioning now, I mean the barriers, are the final products, the one that was developed by the group under Clarence Johnson and Kellex, but using the Nix methods and Union Carbide methods combined. Urey: You have to understand that Nix was not a good man to manage a big job. He invented the thing, but he did not know how to manage a big group of people and put it across. It was difficult. This is not to say mean things about people, but this is true. He invented it. He had the idea of how to put the thing together. Groueff: Which was a tremendous contribution. Groueff: At that time, you were less and less active in leading this group? Groueff: You sort of faded out? Urey: The Kellex Company took it over. It was a big engineering job. I just did not pay much attention. General Groves did not like my skepticism. It was all right, and then toward the beginning of 1945, he asked me to leave the job. It was February or something like that. They relieved me of my duties. I did not mind. It was a job that I did not want to do anyway. I did not care. I never wanted to do the job. It was going to succeed, you see. Now they did not need me anymore. Groueff: At that time, were you more optimistic about the other methods of separation, like electromagnetic or centrifugal? Urey: No. The electromagnetic I thought was one of the most fantastic jobs I ever looked at in my life. How anyone would have the nerve to try to separate the isotopes by this method I did not see. The centrifugal I thought got a rather bad deal during the war, as a competitor. I have not felt very strongly about it since. Groueff: I understand that when they sent, in the beginning of 1942, this reviewing committee with W.K. [Warren Kendall] Lewis and some DuPont people to see the three or four methods, they also said that the Lawrence method was incredible. It was a very bad method, but it had one advantage. First, they produced a few micrograms and secondly, they have the personality of Lawrence. He was a terrific sort of salesman also, and the driving that he would do. When I talk to Berkeley people, they all say it was a bad method. If you do not take into consideration the cost, and the money and the time, then it works. Otherwise, it will be crazy. Urey: What was most curious about that committee, that committee never visited Columbia. They never looked over what was going on. Groueff: They said they did. I talked to [Crawford] Greenewalt and DuPont, who said that they—I think they visited the lab. Urey: Who was it? Who was on that committee? I forgot. Groueff: It was Lewis. [Eger] Murphree had to be there, but he was sick. There were three DuPont men, Greenewalt, [Roger] Williams and [Tom] Gary. Urey: I remember the meeting in the office downtown, in which it was discussed. That is the only thing I remember. Groueff: The Woolworth building? Where was your office? Urey: No my office was out at the university. I think it was in the office of the man at Standard of New Jersey. What was his name? You mentioned him. Urey: Murphree. I think it was at the office of Murphree. I think so, yes. I remember that meeting down there. You say they did visit Columbia? Groueff: They said they did visit the laboratory. They thought it could be done, provided you found the barrier and the pumps, and the pipes and the corrosion problem. Then you could do it. Groueff: And this was solved mostly by industry? Urey: I think that the barrier, as I say, was discovered by Nix, who was at Bell Labs. The method of putting together such things came from Felbeck. Groueff: Industrial people. There were very big problems of plating the pipes against corrosion. All this came from industry, rather than the laboratory? Urey: Oh yes, instead of the universities. We ran tests and things like that. But mostly, the development of these ideas was industrial developments. Groueff: Who were the members? When we say the Columbia group, outside of Dunning and Libby, as you mentioned, who else was it? Booth? Urey: [Eugene T.] Booth and Boorse? Urey: Nier from Minnesota and Mark Ingram from Chicago. They were running the analytical work. They were running the tests on whether we got separation or not. They were on the analytical side—the mass spectrographic analytical side. Booth, and Boorse, and Dunning and Karl Cohen. Groueff: Is he a chemist or a mathematician? Urey: He is a mathematical chemist. He took his degree in chemistry, but he is a theoretical mathematician. He is at present up at Stanford. He is with General Electric up there. This man kept a diary. Groueff: Cohen. That could be interesting. Urey: You might find it very interesting to talk to him. There are certain details about this question as to whether it would work or not. He called my attention to certain things. Dunning and his crowd tried to sue the United States Government for damages on the basis of patents it got. Urey: Cohen had a diary that was very important in that and I think he finished it, because he had a record of exactly how things went. Groueff: He worked mostly on the principle of the cascade? Urey: The principle of the cascade. He is the one who told us how big the machine had to be. Groueff: Later for the industrial translation of that, the job was taken over by Manson Benedict? Urey: Manson Benedict. That is right. Karl Cohen did the first orienting work on that. Urey: Yes. I think that there was a little personal jealousy involved there. I think the industrial people pushed Karl Cohen out. They did not want to have anything to do with Karl. I think there was a little personal jealousy involved there. But I must say that Manson Benedict was a very capable man on this. Groueff: He is quite a scientist. Urey: Quite a scientist, I am sure. He is a very good man. Groueff: In the book, they describe this sort of antagonism between Dunning and you, not antagonism but a complete lack of understanding. Groueff: You are just two kind of different people? Urey: Two different people. I am not fond of Dunning at all. He is not one of my friends. Did you ever notice that he does not seem to have any other friends? I have friends at Columbia, for example, Polykarp Kusch, whom I see a great deal. I do not think anyone is friendly with Dunning. Groueff: Dunning is just alone. Urey: Dunning is a very smart promoter. That is what he is, a very smart promoter. Urey: Not the slightest. You know what you find in a case like this, from time to time? There is an ambitious young man that does not want the famous man around. Urey: He was a young man starting out. He did not want the famous man around. That is all. I have run across it many times since. I have difficulties in connection with the same kind at the space program. I am sure it is there. You find some young men come along and they pick up the idea of the older man. Then they run with it. They take it away from the older man simply by developing it in a way that he cannot keep up with, you see. The older fellow is exceedingly fond of such a man as that. He thinks he is a marvelous guy and so forth. It works this way. Another young man comes along. He fights everything the older man says. He proves everything the older man says is wrong, you see. He thinks that is the way to get ahead. This does not make for good friends at all, you see. I classify my relations with Dunning in the second group. Groueff: It was not only differences in opinion about the feasibility; it was also personal. Urey: It was quite personal. Dunning at Columbia, you can see what he has done. He has built a great big engineering building. He is the Dean of Engineering and so forth. He does that sort of thing. He does it very well. He is a very smart promoter. That is right. We just never got along before the project at Columbia. We just avoided each other. We have avoided each other ever since. It was just an exceedingly unfortunate thing that we were pushed into this position. I tried to avoid it. Groueff: And you to be the boss? Urey: I tried to avoid it. I tried to get out of it and let him have it, let him run it. In fact, I wanted to get permission to move to Chicago and work with people there in some way, or do anything I could to help. I tried to get out of the Columbia situation entirely. Groueff: How did you get along with the other scientists on your committee, like Fermi? Urey: We got along all right. Groueff: What kind of a man was Fermi personally? Urey: A very quiet man; an exceedingly intelligent person, just brilliant. Groueff: You would put him in a category of genius? Urey: Lawrence is a very good engineering promoter. Groueff: More than a scientist? Urey: More than a scientist, yes, much more than a scientist. It is very difficult to find anything scientifically that Lawrence did. Groueff: What about the cyclotron? Urey: He built the cyclotron. The scientific things were always done by other people. Groueff: So he did the engineering part? Urey: The engineering part. Lawrence was essentially an outstanding engineer. Groueff: A good leader? A good administrator? Urey: Compton was a very good scientist. He got along well with his people. They all were very fond of him. I was personally very fond of Compton. I found him a very good friend of mine. Groueff: He did a good job then? Urey: He did a very good job there. Things went very well. He collected an outstanding group of scientific people. That is where the science was. At Columbia, it was an engineering job, a chemical engineering job. Groueff: The science was in Chicago? Urey: The science was in Chicago. Groueff: Did you work with some of the refugee scientists, like [Leo] Szilard or [Eugene] Wigner? Urey: Let me tell you. Szilard never made much of a contribution scientifically to the success of this problem. He brought it to the attention of the President. He worked with Einstein to get this letter out. Szilard understood what the significance was, but he made almost no contribution to the solution of any of the scientific or engineering problems. Urey: I do not know what he worked on scientifically. He was mostly traveling all around the country, in Washington to see Einstein, to see me. I met him everywhere. Groueff: He was mostly on the political side of it and selling the idea? Urey: That is right. Of course, he had the idea that the chain reaction should work. That was way back in the 1930s, when neutrons were first discovered. As soon as fission was discovered, he thought the chain reaction would go. He had this fundamental idea. Szilard was a very bright man. Szilard just did not work in science. That is all. Groueff: Even later in life, he was more involved in the moral side or political side of the problem? Urey: Wigner is a very good scientist. He worked solidly on science right along. Groueff: [00:36:00] He did not work on this part of the reactor? Urey: No, not at all. Groueff: Did you work in the Los Alamos part of the job, the assembly of the bomb? Groueff: You were never with Oppenheimer? Urey: Niels Bohr visited this country. I suppose he made great contributions to the theory of the thing. Groueff: The beginning. He and Fermi explained what was being discovered in Germany. Groueff: You did not have personal contact through the Manhattan Project base with them. Your contact, in other words, was one side with the Columbia group, with some of the industrial people and the committee, with Compton, Lawrence, Fermi and Briggs, the Briggs committee. Groueff: It was with administrators, Groves. I understand Groves is also a completely different man from you. Is that also a personality thing that you did not get along? Urey: I do not understand why we did not get along. I have never understood at all. He had an enormous energy. All Groves had to do was be polite to us. We would have all thought the world of him. I always thought Groves was a remarkable administrator. Groueff: He seems to be a man with such drive and so decided that it had to work, that everybody who even doubts – He had no consideration for people’s feelings, himself. He had no time and no interest. The job had to be done, no matter whose toes you step on. So a lot of you scientists are not used to this kind of man. Urey: We were not military people. It may just be that. Groueff: He is an intelligent man. Urey: He is an intelligent man. He was a very vigorous man. I must say that I have great admiration of what he did. Urey: I just do not quite understand why. I never understood. For example, take the problem of dropping the bomb. We went to Chicago and Leo Szilard stirred up a lot of talk about the news demonstrations and so forth. I agreed completely with Groves, right straight through. I did not believe it possible for the President of the United States not to use an effective weapon that would save the lives of a large number of American men. It just can’t be done. That is all. You may say at the end that it will be a mistake and everything else. You just can’t expect that. I think that recently Truman, in one of his important decisions that has been put out, and I have seen one or two of them, I did not see this one, referred to my position on this. He is one person that recognized that I was on that side on that question. On the other hand, it always seemed to me that Groves was awfully happy to drop the bomb. I was not. Groueff: You knew it was inevitable? Urey: Here is that Army training again. Groueff: —and saving a lot of American lives. Urey: Most of the time, the people at Columbia really did not worry about this problem. We did not worry about it. Groueff: You were too busy with day-by-day problems. Urey: With the thing, and we were sufficiently far away from the actual construction of the bomb that we did not worry about it. I think mostly that we did not worry about it. Groueff: It was not your job anyway. Urey: It was not our job anyway. Groueff: I even see people who are directly involved with the bomb, like Oppenheimer. God knows he is not a militarist. He was also in favor of dropping it when they had the Franck report and Szilard. They asked him. Your work was mostly in this unhappy supervision of the Columbia group with the gas diffusion. What else did you do after that? Groueff: After the problems of the barrier were solved and all that. Urey: There was nothing much left. Then it was completely an engineering job, of building the big plant. Groueff: In other words, your job during the war was not a full-time job with the Manhattan Project. Urey: Oh yes, I was full-time, all the time. After the chemical problems were solved ones, it became a great big engineering job and there was not anything for a scientist to do anymore. Groueff: Where were you located, in New York? Groueff: You spent all those years in New York? Groueff: Dr. Urey, I would like it very much if you could give me some of your background, personal background, where you come from, what kind of family, what education. Urey: Well, I was born in Indiana. My parents and grandparents were farmers in Indiana. They cut down the big trees of Indiana. Groueff: What origin are they? Urey: The name is English. All the rest of my grandparents are German. Their names are Hofstettler. Hofstettler is a corruption. It was Hochstettler or something. And Eckhart and Reinoehl, very German, you see. Groueff: Urey was one of the grandfathers. English? Urey: Yes, English. I was born there. I spent a short time in California when I was very small. My sister was born in California. I went back to Indiana. My father died when I was six years old. Groueff: He was a farmer? Urey: He was a schoolteacher, and a lay minister in the Brethren Church, the Duncan Church. Urey: The Brethren Church. It is a very small sect. There are only a couple hundred thousand people in the United States now. Urey: It was the northeast corner of Indiana. We were about five miles from Waterloo and Ashley, and 12 miles east of Kendallville, Indiana, and about thrity miles north of Fort Wayne, out in the country. As I say, my father died when I was six years old. My mother married again when I was ten. My stepfather was not a well-educated man, but he was always very good to me. Groueff: You do not come from an intellectual family. Urey: One of my uncles on my mother’s side was a professor at Oklahoma for many years. He went into education. Not otherwise, though. I got a high school education because my father asked that his life insurance be used to educate his children. That got me to high school. Groueff: Were you a well-off family, or modest? Urey: Poor. We were very poor. I remember terribly poverty stricken days. Urey: In my childhood, yes. I got a high school education sort of by chance in this way. Groueff: Because of the insurance. Urey: Yes. Of course, if my father lived, I’d have never gotten an education. Before I got through high school, my stepfather and mother went to Montana on a farm there. I taught country school one year in Indiana, with only a high school education in those days. I went to Montana and taught two more years of country school in Montana. That was south of Livingston, Montana, in the Cherokee Mountains one year and the Gallatin Mountains the other year. One of my acquaintances there decided to go to college. This gave me the idea that maybe I had better go to college too. I went off to the University of Montana to college. Here I made contact with some very good teachers and was sort of on my way from that time on. I was away from home. I was taking care of myself. I was not well-off or anything, but I had an income of my own. Groueff: Were you interested in science at that time? Urey: I became interested in science in college. I have a Bachelor’s degree in zoology. Groueff: As a child, what kind of boy were you? Urey: Very studious. However, my school only ran seven months a year. I took the examination to pass out of the eighth grade. I remember it very well. My grade was seventy-six and passing was seventy-five. Groueff: You were not one of those precociously bright? Urey: I think probably, I was the brightest kid in school all the time. That did not say very much, you see. The opportunity for intellectual activities was not very great. Then I went to high school. Here I was late to class all the time. Groueff: What were your interests there? Urey: I thought I would be a Latin teacher when I got to high school. Urey: I mostly got very good grades in high school. Groueff: Not so much on the physical side like sports? Urey: I did not care much for sports. Urey: No. And I was not much interested in science in high school. I liked my zoology. I did not like physics. It was a terribly dull course, physics. Urey: I liked my mathematics. Groueff: At that time, were you interested in philosophical or religious problems? Urey: No. I soon became an atheist. As a youngster, I was raised in this very strict religious sect. I read Bob Ingersoll’s books in those days. This spoiled my religious zeal. I went to college and I made a straight-A record in college. I never got less in any subject than an A.
Groueff: You turned to chemistry. Urey: From zoology. With the way I got into chemistry, I had almost as much chemistry as zoology when I graduated with a Bachelor’s degree. I was in Philadelphia during World War I, at the Chemical Company, working on chemistry. Then I went back to the University of Montana as an instructor in chemistry. From that, I got diverted into chemistry. I had almost as much chemistry as I had zoology when I graduated. Groueff: What was your home after you finished studies? Or you traveled? Urey: I was always on the move. While I was at the University of Montana, my parents moved from Montana to Idaho. I had never lived in Idaho, so I could not call that my home. My home was the university. I went to Philadelphia. That was my home. I went back to Montana and that was my home again. I went to Berkeley and they had tuition for out of state students. I said I came from Montana, but my home was not in Montana. My home was in California now. I went to Bohr’s Institute after getting my doctorate degree at California. I was there for a year. Then I came back and was for a brief time, for a month, at Harvard University as a National Research Council fellow. I resigned this and went to Hopkins as an associate in chemistry. I was there for four years. I went to Columbia and was there 15 or 16 years. I went to Chicago and I was there for 13 years. Groueff: Where did you do the heavy water job? Groueff: When you received the Nobel Prize, you were at Columbia? Groueff: How old were you when you got the prize? Urey: Forty-one. That was 1934. Groueff: Your career was always connected with some university. Urey: Except for that period during World War I. I was at the Bayer Chemical Company in Philadelphia. We were manufacturing phenol and toluene, for explosives in World War I. This was the thing we were doing. Groueff: When did you get interested in the theoretical problems, or even philosophical or astronomical, cosmological? Urey: After the war. I had been trying to separate isotopes by chemical means. It was a tough job. The theory was not too difficult. I had worked out the theory of this. The carrying it out was a chemical engineering job, again. I was thoroughly tired of it by the time the war started, and then I had to keep this up during the war. After the war, I did not want to do that anymore. As a matter of fact, if I had done something like this and if I had succeeded with it, the Atomic Energy Commission could always pick it up and do more with it than I could. I did not wish to be in classified work. I wished to be in university and I wished to do scientific work. I looked around for other methods of applying things. I got onto the idea of measuring the temperatures of the ancient oceans, which is used by some people at present time and is considered to be a rather interesting development. From this, I got interested in geology and my friend Harrison Brown of Caltech got interested in meteorites, and because he was interested in meteorites, I got interested in them. So I drifted from one thing to another. Groueff: What are you working on now? Urey: Here, I am trying to understand why certain minerals appear in the meteorites. How could they have possibly been made in nature? Groueff: You are still in meteorite research now? Urey: Yes, meteorites and the origin of the solar system, as well as astronomical problems like that, what the Moon is and things like that. I have a theory for the origin of the moon. Groueff: What is your theory, in two words? Urey: My idea is that to begin with, the sun contracted as a star and left behind a disk of dust and gas, which was rotating about the sun. This is unstable, gravitationally, and broke up into small objects of approximately the size of the moon, 1/10 the size of the moon or something like that. It is a component of gases. These objects were further broken up and lost gases. Finally, they accumulated into planets. The moon is one of these original objects. Urey: It was captured by accident by the Earth. I have friends that think it is a good theory. In fact, this recent medal they gave me mentioned this as one of the reasons for the medal. I have others that are sure everything I say about it is wrong. Groueff: You also have a theory, from what I recall, which is contrary to the general, that the Earth was created hot and it is cooling off. You think it was created relatively cool. Urey: It was relatively cool and it is warming up. The moon was accumulated cold and is warming up. Groueff: Is this theory accepted now? Urey: I think the idea that the Earth did not accumulate as a completely molten ball is generally accepted at the present time. I think that is true. Groueff: You did all this work after the war. Before the war and during the war, did you have some interests like that, or some work? Urey: I will tell you something. I have a joke with my astronomical friends. I tell them how you cannot consider me an astronomer. One needs a ticket to get into the club of astronomers. I ask you boys, whether any of you published an article in the astrophysical journal in 1924. Urey: I did, you see. I say that I am rather ahead of you in publishing in the astrophysical journal. Groueff: What was that about? Urey: It was my thesis. It was an idea as to why the hydrogen atom is not completely ionized. Fermi and I worked on some of the same ideas. I think he put a little bit better shape. My idea was referred to very favorably by Richard Tolman, who was a well-known theoretical man. Sir Ralph Fowler published an outstanding book in English. He referred to the paper favorably. Of course, it is greatly superseded by many other studies since then. That was 40 years ago. What do you expect? I also worked on the properties of the heat capacity of gases, entropy of gases and things like that, using statistical mechanical methods. It was my acquaintance with these methods that enabled us to predict that there would be a difference in the vapor pressures of the hydrogen, the liquid hydrogen. It enabled us to separate the hydrogens. It was also this that enabled us me to predict the differences in chemical properties of isotopes, which has been used to separate the isotopes. One of the things we did not mention during our discussion of the work at Columbia is that we only dealt with uranium. Heavy water was developed at that time, heavy water separation processes. One process that we used at Trail was to electrolyze water and pass it through concurrent scrubbing towers, making use of the concentration of heavy hydrogen in water as compared with the hydrogen gas. This worked out and we secured heavy water by this method. At the same time, the DuPont Company distilled water down in Tennessee. He set up a distillation thing. This was a sort of rough and ready method of doing it. At Columbia, I had a young man by the name of Jerome Spivak who invented the so-called dual temperature process using concurrent scrubbing of hydrogen sulfide and water. This is the process that is used at Savannah River. At the end of the war, nobody paid much attention to heavy hydrogen. Later they decided they had better do something about it. The DuPont Company proposed to use the distillation of water to produce large quantities of heavy hydrogen. Spivak, with considerable trouble, got his dual temperature process adopted. It is our estimate that his process saved the United States government $2 billion. Urey: Of course, Spivak did not do all the work. The people that worked on this process to put up the Savannah River Plant, had worked just as enthusiastically on the more expensive process. Spivak’s invention was a very important invention. This was made during the war. Urey: Of course, these chemical processes are the basis for the separation of the Hydrogen isotopes.